Gov. Jennifer Granholm and Michigan lawmakers tiptoed through another state budget this year, putting up numbers and calling them balanced. But they skated past long-range problems — an omission analysts fear will send state finances spinning out of control. Staying solvent requires inoculation by restructuring government itself, declare several recent studies. The civic group Detroit Renaissance and others have all sounded alarms and proposed fixes. But this year was an election year for legislators — not ideal for reforms that might trim benefits and advantages sought after by special interests. What’s more, Granholm has exhibited minimal leadership skills since taking office in 2003. While past governors led the Legislature, Granholm seldom rolls up her sleeves to tackle reform in the state Capitol. If current spending and tax policies continue, the state’s structural deficit will grow to $9.6 billion by 2017, according to a recent study by Detroit Renaissance and Lansing-based research group Public Sector Consultants. The report, titled “Budget Action Plan,” echoes alarms sounded in 2007 by Granholm’s Emergency Financial Advisory Panel, chaired by former governors Bill Milliken and Jim Blanchard. They urged a “fiscal plan that includes a combination of revenue increases, spending cuts, and reform of how public services are delivered.” The solutions were largely ignored. In early November, Granholm said she may have to issue an executive order by year’s end to cut the budget due to a shortfall of up to $600 million in revenue. Last year, lawmakers did make some changes amid highly publicized sturm und drang. They raised taxes and replaced the hated Single Business Tax with the Michigan Business Tax, itself controversial. Change didn’t come easy. Mosh-pit bargaining ran past deadline, and the state government began to shut down before a deal was cut. The study by Detroit Renaissance offers a road map for reforms: zero in on the prison system, Medicaid, teacher retirement benefits, and state employee health benefits. Prisons: Michigan houses an average of 49,337 prisoners, compared to 35,752 on average for other Great Lakes states. Michigan prisoners stay an average of 44 months behind bars (30 months elsewhere). The average prison stay in Michigan costs 50 percent more — $106,349, compared to $70,567 in nearby states. “Michigan’s strict adherence to the 100 percent minimum sentence for all prisoners is stronger than federal guidelines, which allow for less than the full term (85 percent) to be served. In addition, Michigan does not allow for “good time” credits (which many states and the federal government do) and applies mandatory minimums for all crimes, as opposed to violent offenses only,” notes the report. Teacher retirement: Some 42 percent of the increase in school aid appropriations over the last five years went to pay for the increased cost of public school retirees and beneficiaries. That’s money that didn’t go directly into classrooms. State health benefits: Health-care costs for state employees and retirees exceed the national average for other state employee systems. Not only do the costs exceed the average; the Michigan employee share of the premium is much lower than in other public- and private-sector systems. Medicaid: Cost-savings options include better coordinating care, changing the mix of services from institutional settings to community-based ones, promoting healthy behaviors and preventive care, and delivering services more efficiently. Similarly, revising benefits for teachers and public employees meets resistance from those respective groups. Sarah Hubbard, vice president of government relations at the Detroit Regional Chamber, says the latest budget left much to be desired. “There really wasn’t attention to holding the line on spending — trying to change the operation of government to reduce costs, rather than just making cuts here and there,” she says. Hubbard cites corrections as ripe for reform. For example, there might be room for more leniency for people who miss probation appointments. Such violations in certain cases could be interpreted more as technicalities than as an offense that puts someone back in jail, she says. 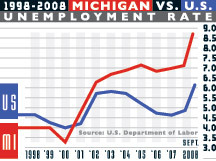 Michigan’s economic woes are myriad. In September alone, for example, the state lost more than 28,000 jobs — one of the biggest drops in the country, according to the U.S. Bureau of Labor Statistics. That gave the state the nation’s second highest jobless rate — 8.7 percent (behind Rhode Island). And in 2007, Michigan was an unenviable No. 1 in unemployment — 7.2 percent for the year, worse even than Katrina-hit Mississippi (6.3 percent). While lawmakers are required to balance the state’s annual budget, overall the budget for fiscal year 2008-09 tops $40 billion, including federal money for education, health care, transportation, and other programs the state administers. A subcategory, the general fund, covers most traditional services from state departments. It’s expected to take in $9.7 billion this fiscal year. The biggest chunk is projected to come from state income taxes (about $4.9 billion). 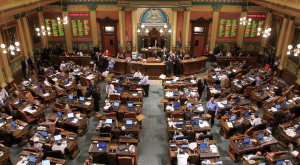 The Michigan Business Tax will take in another $2.1 billion. The rest is expected from a variety of sources, including the use tax ($930 million), tobacco taxes ($216 million), and the sales tax ($93 million). The Pew Center for the States, a research group, suggests the state should curb its reliance on stopgap measures to balance the budget. Tallies by the Citizens Research Council illustrate the headache. Between 2000 and 2007, general fund revenue dropped by $1.5 billion (15.4 percent) and income-tax revenue to the fund declined by $802 million (15.6 percent). However, state-raised revenue for the School Aid Fund grew $829 million (8.0 percent), an annual rate of 1.1 percent. On top of that, a “marked transformation” in Michigan demographics lurks just ahead. The over-65 population will increase by 2.8 percent a year while other age groups decline in number, says the research council. And Michigan’s 552 school districts are in for a special shock. The number of school-age children in the state will drop 1.5 percent a year. That means a drop of 15 percent by 2018. The projection won’t be good news for school boards, which receive money from the state on a per-pupil basis. That’s a standing complaint of businesses that have been in Michigan a long time. They pony up their share of annual taxes, and then, they say, the state gives newcomers the tax breaks, increasing the burden on everybody else. “A lot of states have tried tax reforms, piecemeal attempts at it,” Prante says. “But nothing comprehensive. Some of it’s been bad; some good. But it’s more of a political thing — that’s typically what’s out there. They want to do what sounds good in front of TV cameras. ‘Raise taxes on corporations. Raise taxes on business. Raise taxes on smokers.’ It’s kind of a hodgepodge, what we’ve seen recently. But as Michigan business leaders and economists often note, taxes raise the cost of doing business, and those costs are typically passed along to consumers. In fact, Hubbard says she still hears complaints about the last-minute, 22-percent surcharge lawmakers slapped on businesses last year. Some companies benefited from last year’s business-tax reforms, “but when you added the 22-percent surcharge on top of that, it really did away with most of the benefit that those companies were receiving,” Hubbard says.